Fresh with their success with the Boxee Box, NVIDIA have been showing off the prowess of their Tegra2 chip that powers it, and talking about some of the devices that other manufacturers are working on that will also be powered by the Tegra2. 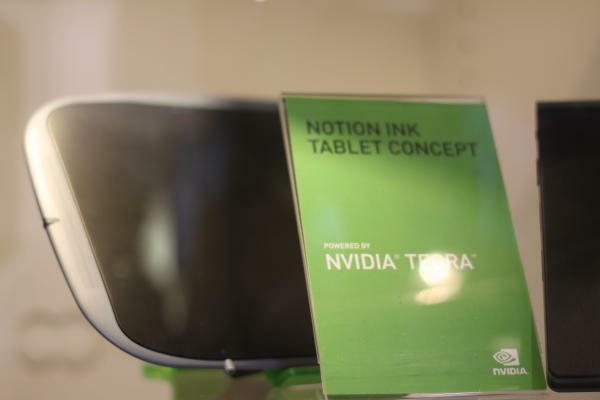 One such developer is Notion Ink, who have revealed a prototype tablet featuring Google’s Android operating system running on top of an NVIDIA Tegra2 chip. The big draw of the Tegra2 is that it supports full 1080p HD, so all you need to do is to hook up an HD source and a screen, and you have an instant HD-capable device. This is pretty much what Notion Ink have done in order to show off their Pixel Qi screen’s capabilities. The ease with which they were able to do it, though, really demonstrates the power of these devices and gives a tasty glimpse into the new tech that’s just around the corner. Because of the Tegra2’s 1080p performance, NVIDIA are expecting many new devices that will make existing HDTVs Internet capable. Just like the Boxee Box, a new set top box can be developed easily with Tegra2 inside that will bring the Web to your TV. It seems that HD content and the Web are finally coming together and NVIDIA want to be right in the middle powering it all. If what we’ve seen at CES 2010 is anything to go by, they’ve most probably will! You can see a video of Notion Ink’s tablet over at JKOnTheRun. Next Tablet – the oddest product in tech history!